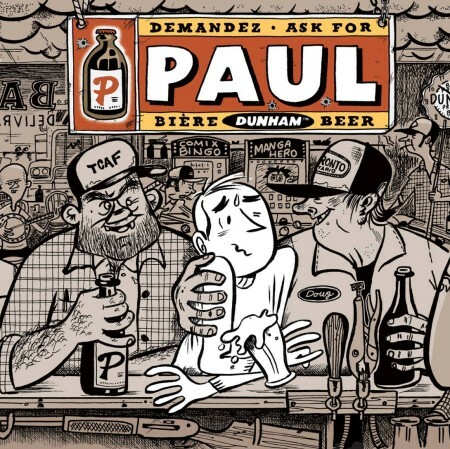 DUNHAM, QC & TORONTO, ON – Brasserie Dunham and the Toronto Comic Arts Festival (TCAF) have announced the release of a new beer created in collaboration with Montreal-based cartoonist Michel Rabagliati. Bière Paul (aka Paul Beer) is a 5% abv hoppy pale ale fermented with wild yeast that is named after the protagonist of a series of semi-autobiographical graphic novels by Rabagliati. Paul appears as the central character on the Rabagliati-illustrated label, which features a stylized image of a typical old-time Quebec tavern. Bière Paul will be launched tomorrow (April 29th) at Brasserie Dunham (3809 Rue Principale S., Dunham), with a launch event from 12:00 noon to 5:00 PM featuring an exhibition of artwork by Rabagliati, and a meet & greet and signing with him and several other Quebec artists and cartoonists including Iris Boudreau, Richard Suicide, Julie Doucet, and Benoît Tardif. Bottles of Bière Paul will be available to purchase for $4 per 375 ml, or $40 for a 12-pack, and books by Rabagliati and the other artists will be on sale as well. A Toronto launch event will follow on Saturday May 13th during TCAF 2017. Taking place at The Pilot Tavern (22 Cumberland St., Toronto) starting at 7:00 PM, attendees will be able to purchase bottles for Bière Paul to drink on site, and Rabagliati will be on hand for part of the evening to sign empty bottles for whose who want to take a souvenir home. For more details, see the Facebook listing for the Dunham event, and the Toronto launch info on the TCAF website.